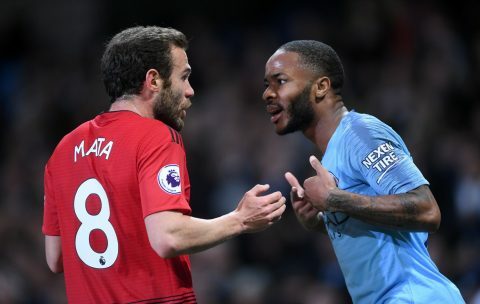 Manchester City winger, Raheem Sterling has revealed that Manchester United Juan Mata told him to â€˜show a little respectâ€™ during Cityâ€™s 3-1 victory over United last month. Sterling angered Unitedâ€™s players in the closing stages of the game at the Etihad Stadium by doing several stepovers with the ball to run down the clock. After the final whistle, City manager Pep Guardiola was also angry with Sterlingâ€™s antics and confronted him on the pitch. â€œHe [Guardiola] doesnâ€™t want us to disrespect anyone. I was surprised,â€ Sterling told The Times. â€œI was keeping the ball in the corner. I can understand if we had lost the ball, and theyâ€™d gone down the other end, but I am trying to waste time, attract a foul. â€œI wasnâ€™t trying to take the mickey out of them that they have lost. â€œI wasnâ€™t trying to disrespect them. I wouldnâ€™t.